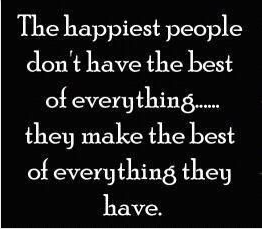 Happy Tuesday everyone! I did a post over 2 years ago about a pvc pipe gate I made for our dog Annie. Click HERE for that post. 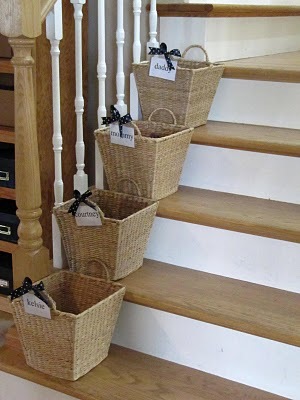 On the stairs, where that gate is, are baskets for each member of my family. I call these baskets Crap Baskets. Why? because when I find things around the house that need to go upstairs, I just put all the "stuff" in their basket and then "THEY" have to bring up all their own crap...hence Crap Baskets. Well, I purchased these baskets in Walmart over 3 years ago. I've had so many emails asking where I purchased them. 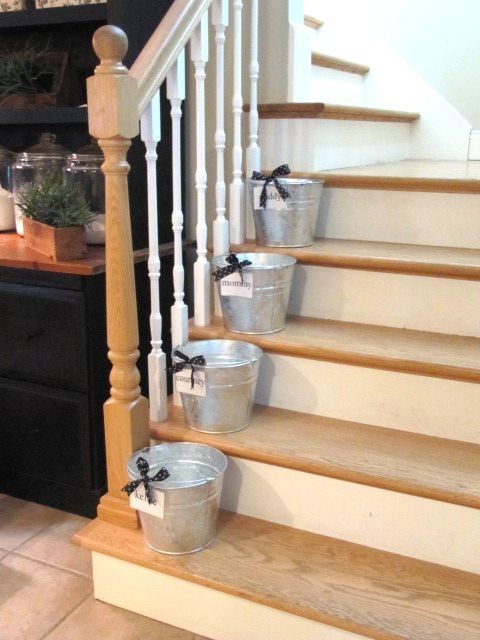 They fit the stairs perfectly, but I can't seem to find this exact basket in the store any more. I was on a mission to help you find a replacement. 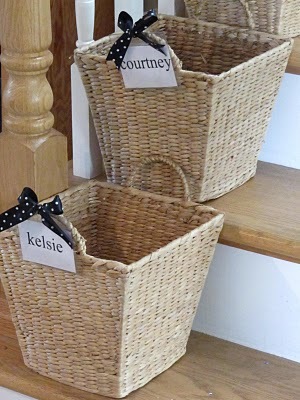 Here is a close up of the baskets. Each person has their name on them. 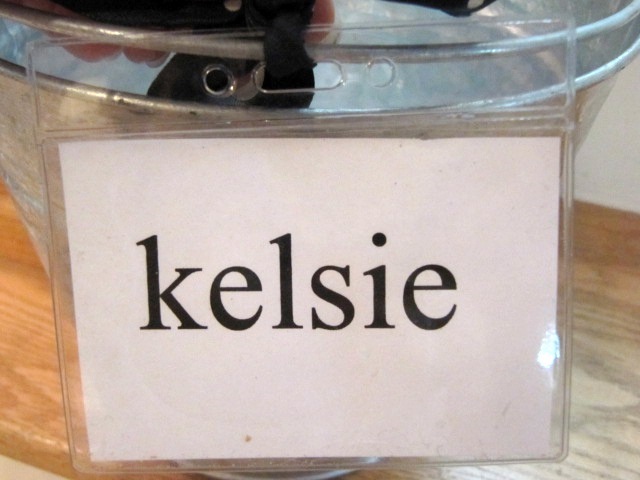 The name is in a Name Badge Holder. The clear plastic sleeves from work or conference badges. Here is today's Tool Time idea for another "basket" replacement. Everyone still has their own name tag. The plastic name holders are from any office supply store. They are name badge holders for business meetings or conferences. In Walmart, they are $1.88 for 12. Another idea for labeling them would be to use Chalkboard Paint on the front of the bucket. That way you can change up the name for any use. 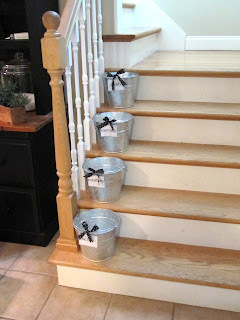 Here's a cute idea for the baskets when they are empty...use them for Holiday decor. My husband's basket is usually empty, so his bucket is perfect for this idea. 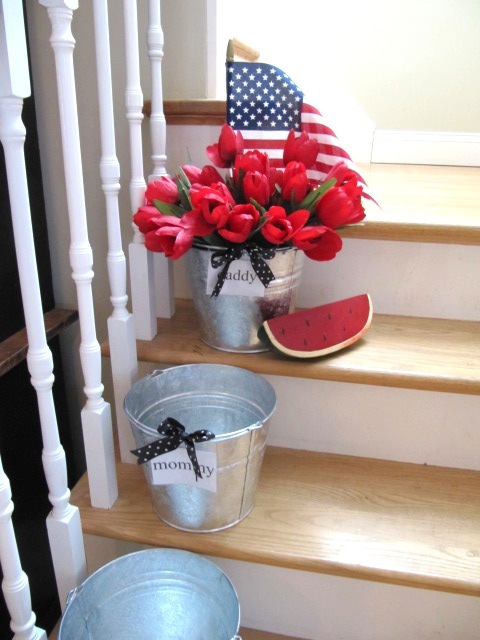 The buckets are from The Tractor Supply Store for only $3.99. They have smaller ones too! 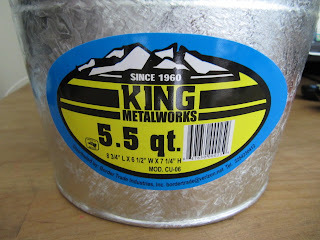 The size that fits my stairs is 5.5 quarts. Hope this helps for a replacement for the baskets. You know I love my galvanized buckets, so I love this idea. 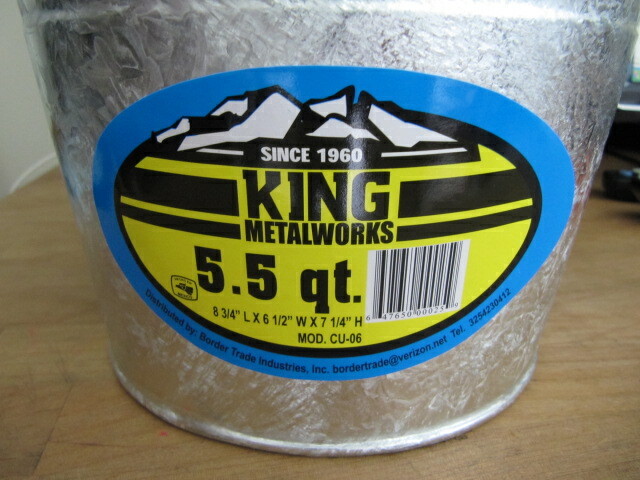 I purchased some for my sewing room too. I'll have that post ready at some point. Clever and cute. I absolutely love it when beauty and function combine. 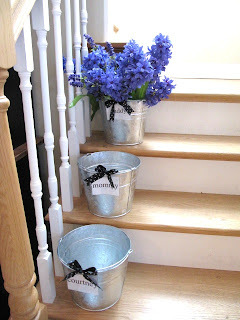 I love galvanized buckets. 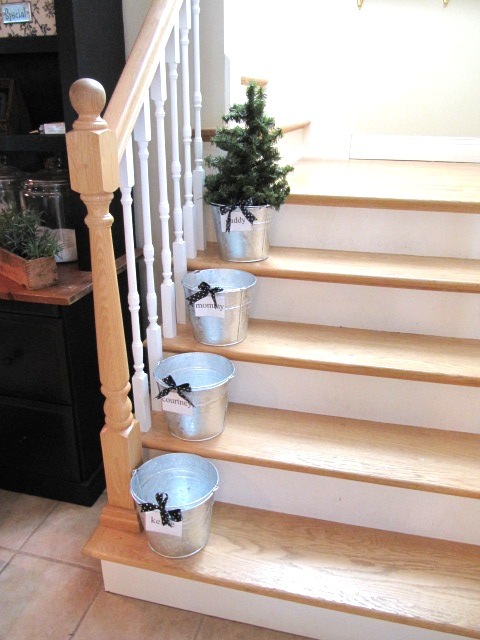 These look great on your stairs. 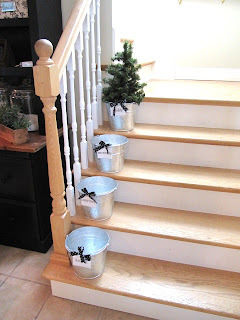 I think I might have to try this out for my stairs too. Vou fazer aqui em casa a sua ideia,mesmo não tendo escada.Tenho uma pequena bancada que virou porta-treco,as coisas vão se acomodando em cima.Dentro de cestos ou baldes ficarão com bom aspecto.Obrigada. VERY CLEVER!!!! I like that you decorated them for the holiday/seasons too! What a great idea. I'm thinking some for my sewing room too! Thanks so much for sharing! The tricky part for me would be getting them to bring the baskets back downstairs!! I love this idea so much. I've gotta get to that Tractor Store! 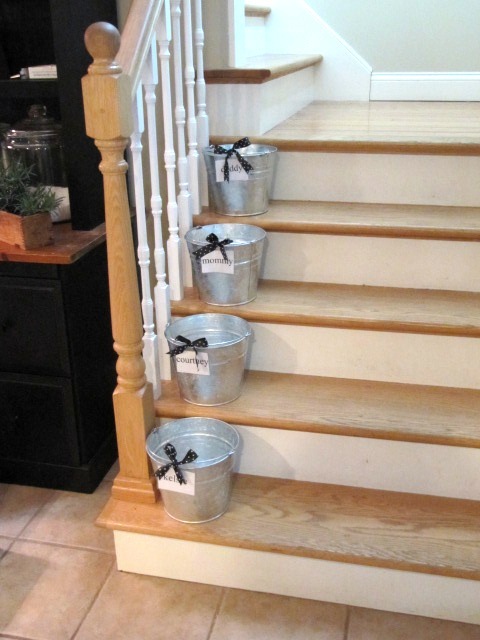 the buckets are a great idea, plus my yorkie may not walk away with it the way she would a basket. ok...crap buckets?? 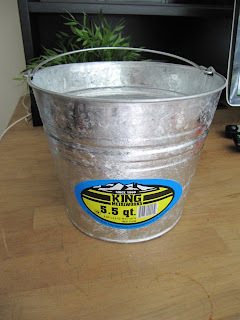 Gives me the mental image of night-pails from before we had indoor bathrooms....eeuuw. The stairs we have are too steep (old house, stairs to basement) and narrow to try buckets on the stairs, but now I'm thinking about other options... hmmm. You are a hoot! Love this idea. 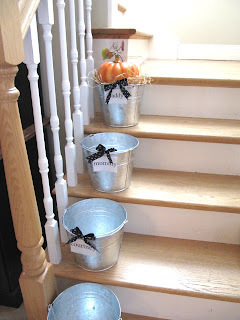 I have piles for each of my kids on the stairs -frustrated that there are piles on my stairs! 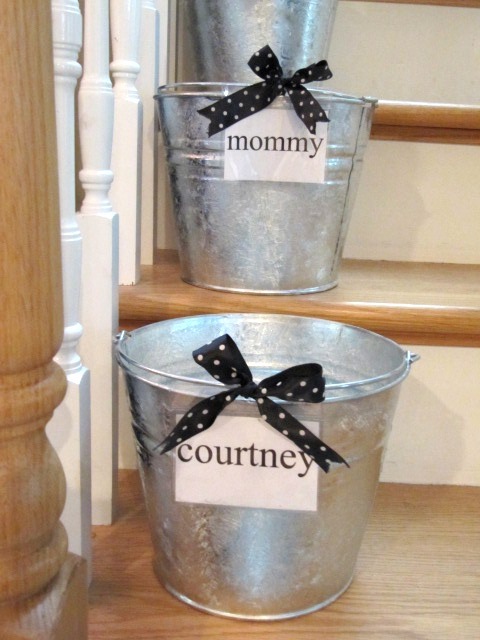 But theses buckets and baskets are perfect. Going to Walmart today. THANKS! These are great! I end up piling the stuff on one of the steps anyway so a basket would really help with keeping it sorted. cute idea. and I like how you dress them up for each season. What a great idea!! I could do with a few crap baskets !! I need this! Our stairs always have all kinds of crap over them the kids are supposed to take upstairs but of course they never do. I will probably be doing this and posting about it this week with a link back here. Let me know if that's not ok.
oh, also, what size are the baskets you originally used? I wonder if Ikea would have something. Or the dollar store has really cute plastic buckets. Maybe I'll try those to start since my kids like to destroy everything. They're all boys! I would love to find the original baskets...perfect size!